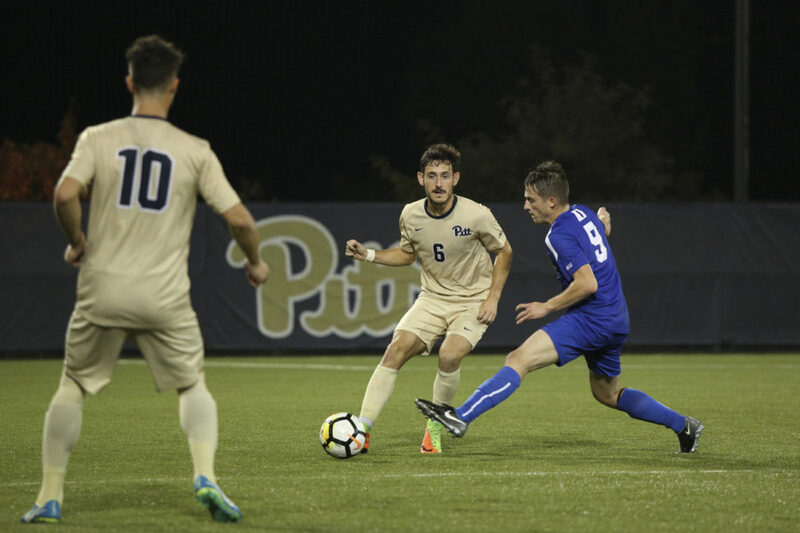 Pitt and Duke men’s soccer teams fought fiercely for 110 minutes of regular and extra time in Sunday’s ACC quarterfinal match at Duke’s Koskinen Stadium. But in a game that came down to penalty kicks, the Blue Devils had the advantage and ended the Panther’s historic season with a 4-3 loss. After upsetting No. 7 Virginia to win its first ACC tournament game in program history on Oct. 31, Pitt (8-10-1, 2-6 ACC) had 13 shots and four on goal while the Blue Devils (10-5-2, 5-3 ACC) had 18 shots and six on goal. 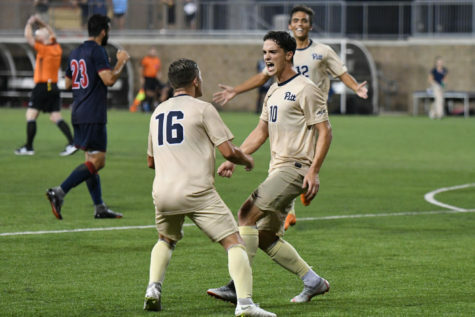 In a game that was evenly matched on offense, it came down to both team’s young goalkeepers — Pitt’s first-year Johan Penaranda versus Duke’s sophomore Will Pulisic. 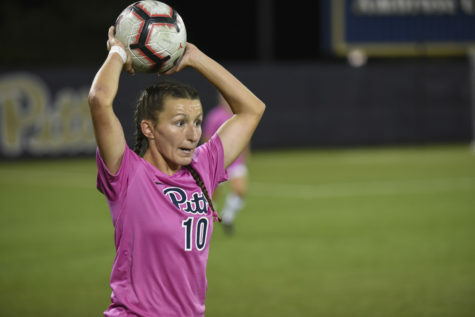 Pitt seemed to carry the momentum from last Wednesday as it started its attack early and got back-to-back corners in the fourth minute. But between missed shots and nice saves by Pulisic, the Panthers were never able to find the goal. 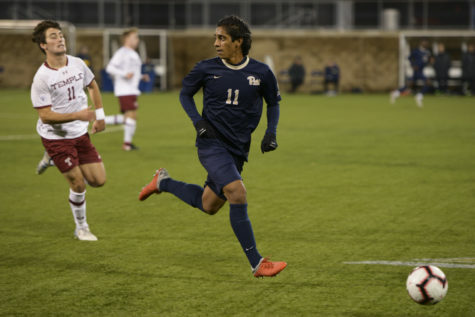 In the first half, the Panthers had an opportunity to score in the 12th minute on a corner by Pitt senior midfielder Javi Perez. 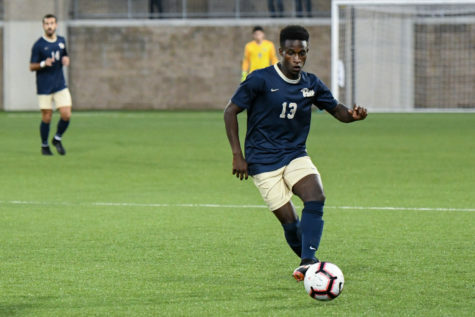 Pitt sophomore forward Edward Kizza got a header that ricocheted off the crossbar and found its way to Pitt’s redshirt senior defender Robby Dambrot, who followed up with a header that also hit off the bar. Pulisic somehow managed to get his legs on the ball to stop it from going in and allowed Duke’s senior midfielder Ciaran McKenna to kick it out, ending the Panthers’ threat. Pitt got the ball back in Blue Devil territory five minutes later when Kizza drove in and made a pass to his teammate, sophomore forward Alexander Dexter. 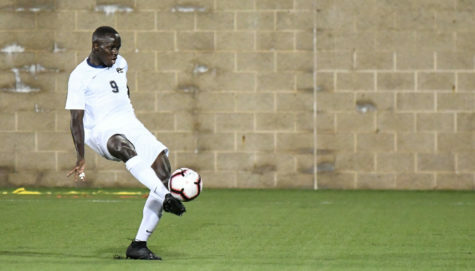 Even though the ball found its way behind Dexter, it was on course to reach the goal until Pulisic made another seemingly impossible save, diving on top of the ball to hold Pitt scoreless. Duke took that momentum and ran with it, taking control of the rest of the first half. The Blue Devils had seven of their 18 shots in the first half of the game. 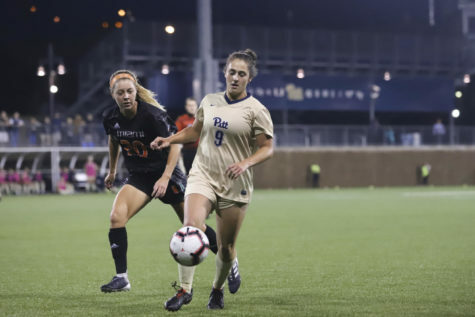 Pitt got a huge break in the 61st minute of the second half when Duke’s McKenna, who already received one yellow card, delivered a dangerous foul on Kizza and was removed from the game, knocking the Blue Devils down to one man. 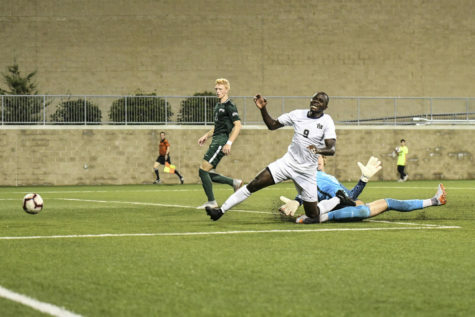 First-year Panther defender Chandler Vaughn took advantage of being a man up 10 minutes later and created a brilliant chance for the Panthers to score when he delivered a cross, which ended up at the feet of his teammate first-year midfielder Rodrigo Almeida. But Almeida couldn’t get enough on it and it went just wide right of the goal. 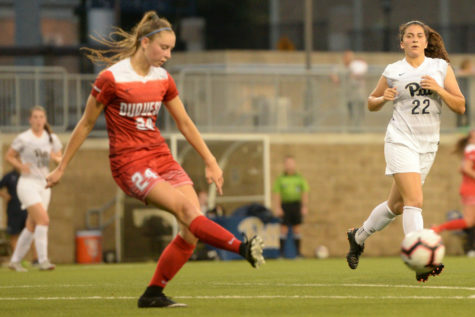 In the 84th minute, the Blue Devils found the net for the first time all game, but the goal was taken back after it was determined junior Daniele Proch was offside. That call was Duke’s third offside penalty of the game. Duke made its way into Panther territory in the final seconds of the game. Proch weakly crossed the ball and when Penaranda went for the save, the ball reflected off his hands right to Doran. Doran crossed it to back to Proch, who hoped to get a header with Penaranda off his line, but it was too high and the game entered overtime. The first chance of overtime also turned out to be Pitt’s last scoring opportunity in the game. Dexter, once again, sent in a cross in the box to Kizza, but his touch sent the ball off the crossbar in the 92nd minute. Dexter managed to get another cross in, but it bounced off of Duke first-year defender Ian Murphy into the hands of Pulisic. 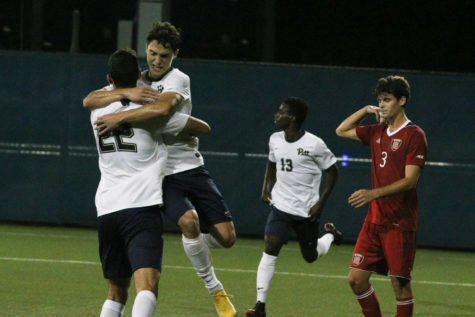 Penaranda punched away a cross from sophomore Blue Devil Kristofer Gardarsson, which wound up at the feet of Duke sophomore forward Daniel Wright, whose shot went wide right to keep things level in the 96th minute. Neither team could make anything of their last chances, sending the game into its second overtime. At the end of the second overtime, the score remained 0-0. 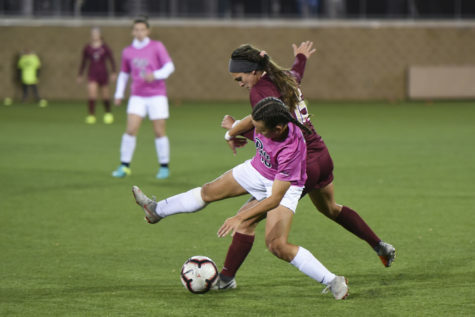 After 110 minutes of scoreless play, a game that was defined by missed opportunities was decided by penalty kicks. Both teams scored on their first three penalties. On the Panthers’ fourth kick, first-year midfielder Jackson Walti went right with a weak shot that was easily stopped by Pulisic. Pulisic then stepped up and sent a powerful shot into the net to give the Blue Devils a 4-3 lead. Gasparri stepped up for one last chance for the Panthers, but Pulisic made the save and ended the game. Both goalies fought until the last minute. Despite Penaranda’s edge in saves, six to four, in the end it was Pulisic and the Blue Devils who came out on top. The last-minute win sent the Blue Devils to the ACC semifinals and Pitt back home to the offseason. Duke will play UNC in the semifinals on Wednesday, Nov. 7, at UNC.